Volvo Ocean Race 2014-15 - published on Jun 27, 2015 - On the final day in Gothenburg the fans lined the shore to watch the final deciding in-port race of the series. With the trophy still up for grabs there was still much to play for. Cape Horn Live replay | Volvo Ocean Race 2014-15 - Published on Mar 30, 2015 - From the Volvo Ocean Race Headquarters in Alicante, Genny Tulloch and CEO Knut Frostad catch up live with the entire fleet live, via satellite, as they near the Mt. Everest of sailing, Cape Horn. NYYC Annual Regatta 2015 Presented by ROLEX - Music Montage - The best shots from 6 cameras of the 170 boat fleet in their Around the Island and round the buoy races. Including the new Rambler, a man overboard and the J111's Pre Worlds along with the most classic wooden yachts racing (published Jun 13, 2015). NYYC Annual Regatta 2015 Presented by ROLEX- Sunday - New York Yacht Club Newport RI June 14th. For the final day the breeze filled in providing the best sailing conditions of the Regatta. All of south Florida, including all of Biscayne Bay, is a fragile environmental ecosystem. Above is a map showing (blue) the regulatory area of the US Army Corps of Engineers, Jacksonville District, Miami Permits Section which has yet to issue a permit for the relocation of the Miami International Boat Show to Virginia Key in Biscayne Bay. Read more below. Miami cuts Virginia Key mangroves to make way for boat show | Miami Herald: "Faced with yet another obstacle in the struggle to host a controversial boat show at Marine Stadium on Virginia Key, Miami city workers found a simple solution last month: chop it down. Only one problem. Cutting mangroves without a permit is illegal. City of Miami workers ripped out red and black mangroves from about 300 feet of shoreline to make way for the International Boat Show at the Marine Stadium... More than 300 feet of shoreline had been stripped of trees, including red and black mangroves which provide valuable protection from erosion and shelter for young fish and nesting birds. A city manager told him the work was being done to ready the site for the International Boat Show. For boat show critics, who have complained bitterly about running the international show so close to fragile marine life and seagrasses where manatees graze, the mistake underlines their worries about potential impacts on Biscayne Bay from the show, long held at the Miami Beach Convention Center. “Every fifth- grader knows the value of mangroves,” said Key Biscayne Mayor Mayra Pena Lindsay." In anticipation of the February show, the city is spending $16 million on the dormant stadium grounds. The National Marine Manufacturers Association [NMMA], which hosts the show, has given the city $3 million for electrical upgrades and spent another $3 million on temporary docks. The show, which must also obtain a permit from the U.S. Army Corps of Engineers to move forward, is expected to draw a crowd of 100,000 with 1,500 boats. About 500 will be tied off to the floating docks, which span 268,400-square feet. Another 800,000-square feet of tents will house vendors. Corps officials have warned that the docks, which could be left in place for up to three months, would block sunlight and affect marine line in about 55.45 acres of the bay. Key Biscayne officials also worry about the risk to surrounding marine life created by boat traffic, including a plan for water taxis to ferry visitors. “To have a conga line of water taxis during high season for manatees just begs the question: what are they thinking?” Lindsay said. 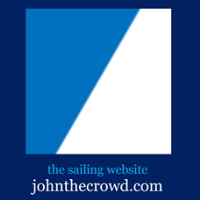 JohnTheCrowd.com urges everyone to contact the U.S. Corps of Engineers NOW. If you were planning to attend the Miami International Boat Show next February, think again--and let the Progressive Insurance Company and Miami International Boat Show and National Marine Manufacturers Association, and most importantly, the U.S. Army Corps of Engineers know what you think about this! Also contact Miami Waterkeeper and ask them to take action. Extreme Sailing Series™ organisers OC Sport have ushered in a new era for the original Stadium Racing global circuit, with the announcement of a new generation of foiling catamarans to be used as part of the event in the future. A panel of the world’s top international sailors and sailing experts gathered at Act 4 of the 2015 global tour in Cardiff, Wales, to discuss the initial concept with OC Sport, and ultimately to have their say on what they want from a new design of boat. Watch the video for a unique insight from OC Sport Executive Chairman Mark Turner, OC Sport Technical Manager Neil Graham, co-creator of the Extreme 40 Mitch Booth and former Extreme Sailing Series champion Chris Draper. Leigh McMillan is a name synonymous with the Extreme Sailing Series™. The British Olympian is the only skipper to have won the Series twice. But what really makes him tick? Find out in the video above. Groupama Team France : The Strenght of confidence - Published on Jun 25, 2015: A land of sailors par excellence, France has won the majority of the competitions spanning the globe’s seas, and yet one prize is missing from its haul: the America’s Cup. Groupama Team France wishes to set the record straight in this regard and get the French campaigning for the oldest yachting trophy in the world. It is with this culture of excellence that three exceptional sailors, Franck Cammas, Michel Desjoyeaux and Olivier de Kersauson, have come together to form Groupama Team France. Individually, they have won it all, in crewed and single-handed configuration and in the media; together they have everything required to carry this project off: the desire, the talent, the ingenuity and the popularity. Groupama Team France takes up the challenge - 35th America's Cup: "With two years until the 35th edition of the America’s Cup, Franck Cammas, Michel Desjoyeaux and Olivier de Kersauson have formalised the launch of Groupama Team France, the French bid to win the oldest sports trophy in the world. Gathered together in the Hôtel de la Marine, the three sailors, in the presence of Thierry Martel, CEO of Groupama, title partner to the French challenge, presented the Groupama Team France project to the press and its guests, with the support of Jean-Yves Le Drian, Defence Minister and Patrick Kanner, Minister for Cities, Youth and Sports..."
QUI QUE QUOI QU'ON FAIT - Le Diam 24 - The Diam 24 One Design is the new official support of the Tour de France Sailing Race. Groupama sailing team presents this new boat and explains the regatta on board the trimaran 7m led three teammates. 2 minute flight with Groupama 45 - To start the week, it takes flight, sea spray and speed! Those three ingredients in a mind-blowing video images with Groupama 45 in the Tour de Belle-Ile. Renaud Laplanche and co-skipper Ryan Breymaier established a new world speed sailing record across the English Channel from the Royal Yacht Squadron Cowes, Isle of Wight to Dinard, France in 5 hours, 15 minutes and 7 seconds aboard their 105-foot offshore trimaran "Lending Club 2" at an average speed of 26.36 knots. Speed Sailing Legend, Insanely Fast Trimaran ‘Lending Club 2′ Spotted In San Francisco Bay, Training For Transpac Record « CBS San Francisco: "Insanely fast barely begins to describe the concept of a massive 105-foot, three-hulled trimaran rising up out of the water and skimming the tops of waves at up to 46 miles per hour. Now imagine sailing it 2,225 miles from California to Hawaii in the Transpac race next month ..."
| Volvo Ocean Race 2014-15 - Published on Jun 17, 2015: Wondered about the brightly coloured suits the sailors wear whenever the weather is bad or the boats are going fast? Often called “Foulies” but more properly, Foul Weather gear – the name pretty much says it all. The sailors go to great lengths to make sure they are wearing the very best clothing around. MUSTO has worked with the race since its early days and each edition is a test track for improvements to pass on to their customers.
" A 65-year-old Richland woman was rescued by the Coast Guard after her sailboat ran aground Tuesday morning in the Straits of Mackinac. The woman was participating in a solo sailing challenge from Chicago to Mackinac Island when her 35-foot vessel ran aground near Round Island in Mackinac County, Coast Guard officials said...."
Volvo Ocean Race 2014-15: After eight years of hard work, Ian Walker and his team Abu Dhabi Ocean Racing to win the Volvo Ocean Race 2014-15 - the toughest ocean race in the world. This is how it happened. Leg 9 review | Volvo Ocean Race 2014-15 - Published on Jun 23, 2015: The fleet completed Leg 9 - the last 1,250nm of the 2014-15 edition of the Volvo Ocean Race. An incredible leg from Lorient to Gothenburg via The Hague, which sealed Abu Dhabi Ocean Racing's triumph. *Each Volvo Ocean Race team received the same points as their finishing position, e.g., first place gets 1 point. All legs counted, the lowest score overall wins. In-Port Race results are only used in the event of a tie in the overall Race. Gothenburg arrivals press conference | Volvo Ocean Race 2014-15 - published on Jun 23, 2015: Long cut of the final arrivals press conference following leg 9 of the 2014-15 Volvo Ocean Race featuring skippers from all seven teams. Jun 22, 2015: The fleet raced into Gothenburg at the end of Leg 9 - and the finish for this 12th edition of the Volvo Ocean Race - in front of thousands of adoring fans. Team Alvimedica was the Leg 9 victor, and overall winner Abu Dhabi Ocean Racing lifted the trophy. Volvo Ocean Race 2014-15: Live recording: Gothenburg arrivals - Streamed live on Jun 22, 2015 - Catch the very end of this amazing and extremely close Leg 9 finish, and the conclusion of the race as our fleet arrives in Gothenburg, their final destination! US Youth Match Racing Championships 2015 - Final Wrap-up - A look back at three tremendous days of match racing at the 2015 US Youth Match Racing Championship for the Rose Cup, the first time this event has been sailed as a national championship. Featuring interviews with US Match Racing Committee Chairman Dave Perry and the repeat Rose Cup Champions, Christophe Killian, Jack Martin and Harrison Vandervort. 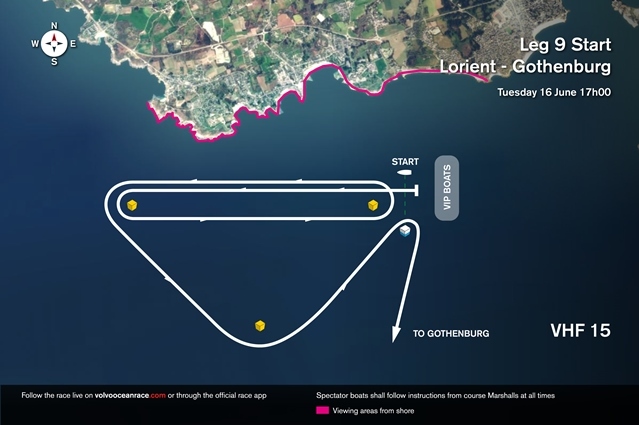 Volvo Ocean Race 2014-15: the big conclusion at Gothenburg, Sweden--the VOR fleet is expected to arrive on Monday June 22nd. Jun 21, 2015: Team Alvimedica reflects on being in the lead and approaching Gothenburg, the final destination, on the very last leg of the race! Inside Track: Leg 9 #6 | Volvo Ocean Race 2014-15 - Jun 21, 2015: With Gothenburg on the horizon this might be the last episode of Inside Track. Genny talks with Francisco Vignale on Team Mapfre and Swedish homeboy Martin Stromberg. The fourth stop on the 2015 Extreme Sailing Series™ eight Act global tour brought together eight top international teams on Cardiff Bay, UK. The Wave, Muscat are Cardiff Champions once again | News: "Just under 60,000 spectators lined the shore over three days, to watch first hand as the teams were battered with a solid 22-knot breeze and gusts of up to 30-knots for the fourth exhausting day of racing, as Leigh McMillan, with double Olympic gold medallist tactician Sarah Ayton and the team on The Wave, Muscat, stormed to an impressive win, putting the Omani team back in the lead at the half way stage of the eight-Act 2015 Series. Topping the leaderboard after 32 gruelling races The Wave, Muscat, took control in the wild conditions, posting five podium finishes on the final day and more podiums over the event then any other team. " All results here. Cardiff delivers “best day of the year” | News: "Cardiff turned on breeze, blue skies and beautiful conditions for racing today (Friday) treating the spectators lining the Welsh shore to Stadium Racing at its best. Despite a number of minor damage delays interrupting the flow, the eight elite level Extreme 40 teams completed seven tough but satisfying races..."
The Wave, Muscat (OMA) Leigh McMillan, Sarah Ayton, Pete Greenhalgh, Ed Smyth, Nasser Al Mashari 153 points. SAP Extreme Sailing Team (DEN) Jes Gram-Hansen, Rasmus Køstner, Thierry Douillard, Mads Emil Stephensen, Brad Farrand 132 points. GAC Pindar (GBR) Chris Draper, Seve Jarvin, Tyson Lamond, James Wierzbowski, Kazuhiko Sofuku 128 points. Red Bull Sailing Team (AUT) Hans Peter Steinacher, Jason Waterhouse, Jeremy Bachelin, Shaun Mason, Stewart Dodson 122 points. Oman Air (OMA) Stevie Morrison, Nic Asher, Ted Hackney, Ed Powys, Ali Al Balashi 109 points. Gazprom Team Russia (RUS) Igor Lisovenko, Phil Robertson, Garth Ellingham, Alexander Bozhko, Aleksey Kulakov 104 points. Team Turx powered by Kaya Ropes (TUR) Mitch Booth, Can Bayulken, Selim Kakış, Diogo Cayolla, Pedro Andrade 92 points. Lino Sonego Team Italia (ITA) Lorenzo Bressani, Enrico Zennaro, Andrea Tesei, Tom Buggy, Stefano Ciampalini 74 points. Jun 18, 2015: In the middle of the night, a tired fleet arrived for a quick pit-stop and some rest in The Hague on their way to Gothenburg on Leg 9. Here's a look back at the highlights. Volvo Ocean Race Pitstop at The Hague - for the first time in the Volvo Ocean Race, a pit-stop. The crews will sail out of The Hague, Netherlands, in the same order and timing that they sailed in, with the first boat (Alvimedica) resuming racing at 12:00 local time on June 20. Maybe you’ve wondered about the brightly coloured suits the sailors wear whenever the weather is bad or the boats are going fast. Often called “Foulies” but more properly, Foul Weather gear – the name pretty much says it all. The sailors go to great lengths to make sure they are wearing the very best clothing around. MUSTO has worked with the race since its early days and each edition is a test track for improvements to pass on to their customers. The Volvo Ocean Race fleet is making a quick pit-stop in The Hague on their way to the finish of Leg 9, and the race, in Gothenburg, Sweden! Watch the arrivals in The Hague above. 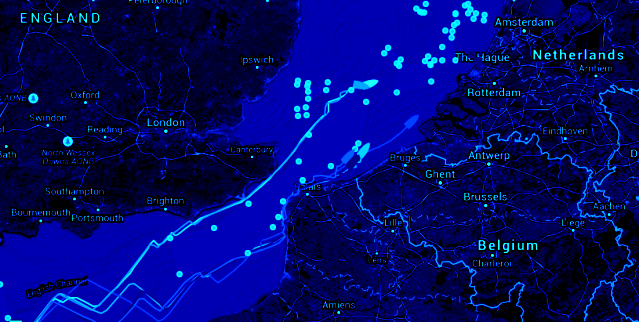 The English Channel | Volvo Ocean Race 2014-15 - Jun 18, 2015: The VOR fleet split today and have been battling their way to the finish on both sides of a huge Traffic Separation Zone in the Dover Channel. After a day of majestic coastal racing we'll see who turns the corner first for the sprint to the The Hague pit-stop. Inside Track: Leg 9 #4 | Volvo Ocean Race 2014-15 - Jun 18, 2015: a dramatic split in the fleet and in this episode we get the sense that it just might pay off for Alvimedica - Genny has their coach and mentor Ken Read on the show and he gives great insight as the Den Hague pit stop looms on the horizon. Inside Track: Leg 9 #3 | Volvo Ocean Race 2014-15 - Jun 18, 2015: Huge split in the fleet in the English Channel, so we hear the decision making process and check in with teams on both sides, Dongfeng Race Team to the North and Abu Dhabi Ocean Racing in the south. Extreme Sailing Series: "As the great British summer of sailing gets into full swing, the eight elite level Extreme 40s are preparing to descend on the Welsh capital for the Extreme Sailing Series™ Act 4, Cardiff presented by Land Rover, from the 18 – 21 June 2015. One of the narrowest city-centre stadium racecourses on the global tour, head to head battles and photo finishes will be the order of the day as the fleet race down the hourglass shaped track in the heart of Cardiff Bay." Inside Track: Leg 9 #2 | Volvo Ocean Race 2014-15 - Jun 17, 2015: Race legend Jerry Kirby joins Genny in a live call with his Newport "homeboys" onboard Alvimedica. They're in the lead as the fleet approaches the Alderney Race, no celebrations yet because things can change very quickly in these close coastal racing conditions. Underwater challenge | Volvo Ocean Race 2014-15 - Jun 17, 2015: As the fleet sails along the French coast, they realize their bigger challenge lies underwater: the ocean currents. Leg 9 start highlights | Volvo Ocean Race 2014-15 - Jun 16, 2015: The fleet said au revoir to Lorient and set off for Gothenburg via The Hague in what is the 9th and last leg of the race! Volvo Ocean Race, In-Port Race Highlights - Jun 14, 2015: All the action from the SCA In-Port Race in Lorient, France! 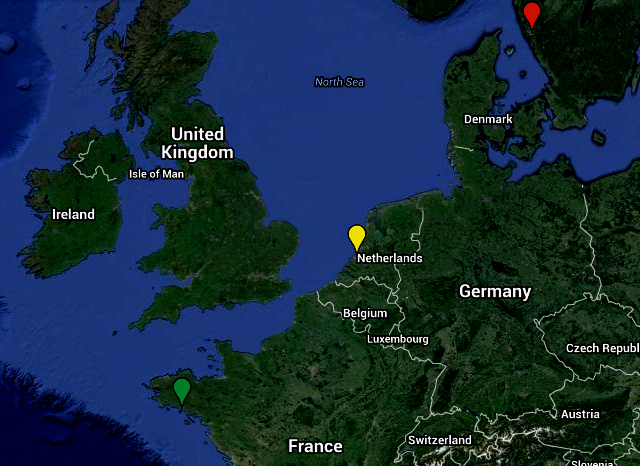 LIVE broadcast (June 16) from the start of Leg 9, the last leg of the race, from Lorient, France to Gothenburg, Sweden, via a short 'pit-stop' in The Hague. 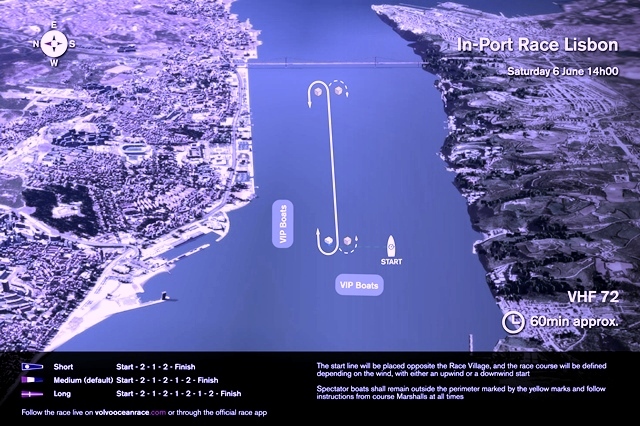 Volvo Ocean Race 2014-15 | Leg 8 Review: After a light start, the crews found themselves in frustratingly changeable conditions as they left Lisbon behind them. Team SCA led around Cape Finisterre and from then on it was heavy going through the Bay of Biscay and beyond with little sleep as the fleet chased the girls all the way to the finish. Comeback kids Team Vestas Wind followed in second and Abu Dhabi took third to cement their overall lead. Sailboat sales rebound--New York yacht sales finally set to rebound after Hurricane Sandy | New York Post: "... Keith Cooper, who sells sailboats and sailboat timeshares (which go for $8,000 to $15,000) at his Chelsea Piers SailTime franchise, says he is already two-thirds booked for the season and expects to fill up soon, a feat that he didn’t accomplish last year. Cooper says he has yet to score a definite benefit from the recently enacted tax break, but he expects to be able to sell “another boat or two” before the year is out. “It won’t necessarily turn a ‘no’ into a ‘yes,’ but it will turn a ‘yes, I want a boat’ into a ‘hell, yes, I want a boat,’ ” he says...."
Volvo Ocean Race In-Port Race - LIVE Recording Replay - Jun 14, 2015: Watch the penultimate In-Port race of this edition of the Volvo Ocean Race, as the fleet battles it out in the port of Lorient, France. 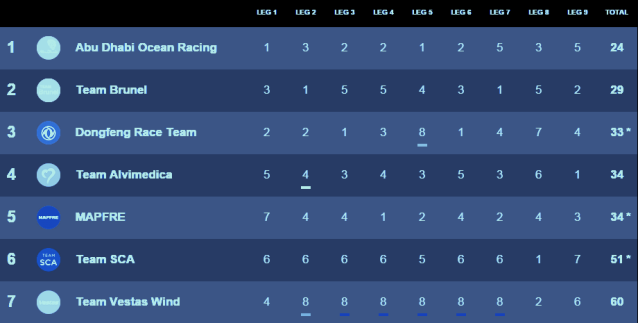 Abu Dhabi Ocean Racing Leads Volvo Ocean Race After 8 Legs (see above) Note: Each team gets the same points as their finishing position, eg first place gets 1 point. All legs count and lowest score overall wins. In-Port Race results are only used in the event of a tie in the overall Race. Tale of two victories | Volvo Ocean Race 2014-15 - The Leg 8 finish in Lorient will be one to remember, as it brought us two memorable moments that will forever be part of the history of this race. 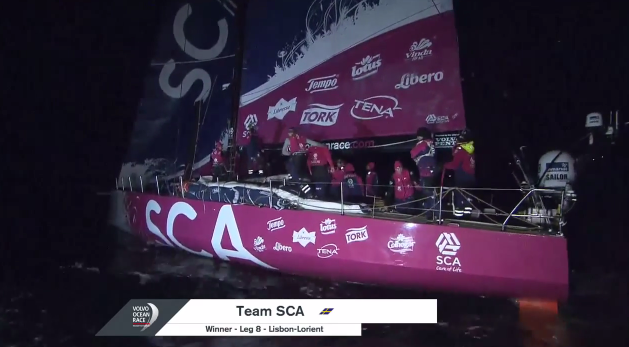 On one hand, Team SCA achieved the first leg victory for a female team in 25 years. And on the other hand, Abu Dhabi Ocean Racing essentially clinched the 12th edition of the Volvo Ocean Race with their podium finish. Volvo Ocean Race - Thursday early morning and the fleet arrives in Lorient, Brittany, France. The penultimate leg of the race is wrapped up now - time for a French break. Victory in Lorient! - Volvo Ocean Race, Leg 8 finish in Lorient, France - published 11 Jun 2015: The culmination of over two years of hard work came together today for Team SCA, as they crossed the finish line after 3 days 13 hours 11 minutes and 11 seconds to take their first leg win in Lorient. 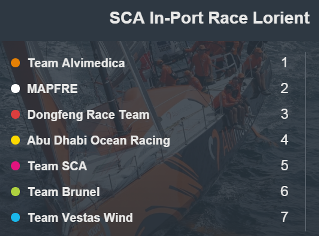 Volvo Ocean Race, Leg 8 finish order: Team SCA first, Team Vestas Wind second, Abu Dhabi Ocean Racing third, MAPFRE fourth, Team Brunel fifth, Team Alvimedica sixth, Dongfeng Race Team seventh. Hours before crossing the finish line to win Leg 8 of the Volvo Ocean Race, Team SCA's shore team isn't about to count their chickens before they hatch, but that isn't keeping the butterflies out of their stomachs as the all-female team leads the fleet to Lorient with a 10nm lead. Live recording: Lorient Arrivals: Volvo Ocean Race, Leg 8, the penultimate leg of the race, came to an end in Lorient, with Team SCA coming in first in an historic leg win, Team Vestas Wind placing 2nd, and Abu Dhabi Ocean Racing coming in 3rd, putting Abu Dhabi in an essentially unassailable position to win the race overall! Volvo Ocean Race - Jun 10, 2015: Team SCA is still leading the fleet as we enter the final hours of Leg 8. With the race being so close, every move, every decision, is key. The Volvo Ocean Race fleet is nearing the finish of Leg 8 at Lorient, France. The sailboats could arrive as early as 4 am UTC [time converter] on Thursday, June 11th--which is 12 midnight EDT (US). JohnTheCrowd.com will post LIVE video of the finish once available from volvooceanrace.com. The women's team--Team SCA--has been leading much of Leg 8, will they finally win a First Place Finish or will Team Vestas Wind claim victory in its return to the VOR after grounding in the Indian Ocean and withdrawal from VOR due to necessary repairs? Inside Track: Leg 8 #7 | Volvo Ocean Race 2014-15 - Jun 10, 2015: It's looking a bit grim in the Bay of Biscay as the fleet enters the final hours of Leg 8. Broken boats and broken bodies, but Ian Walker and the Abu Dhabi Ocean Racing team can almost taste it. 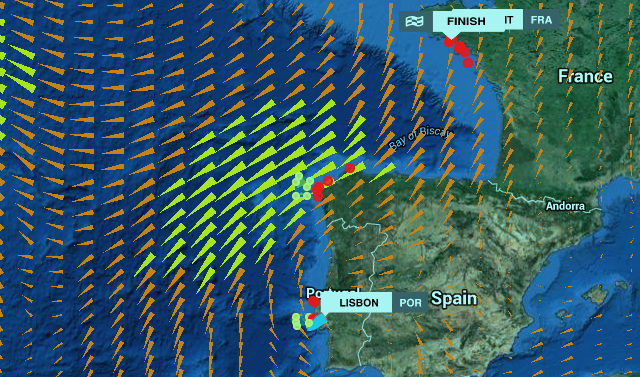 The Finisterre battle | Volvo Ocean Race 2014-15 - rounding Cape Finisterre on Day 2 of Leg 8 to Lorient. 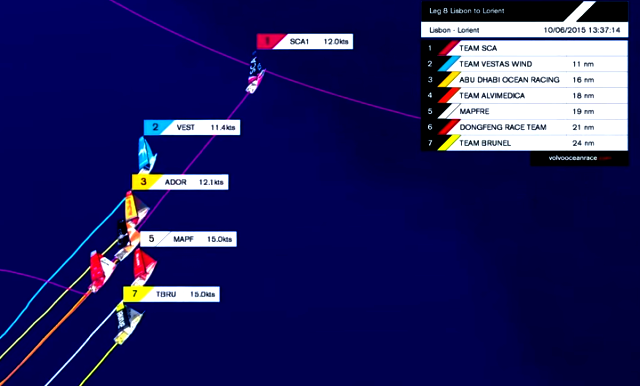 Inside Track: Leg 8 #5 | Volvo Ocean Race 2014-15 - Jun 9, 2015 - the fleet has split! Genny catches up with Race winner "Juggy" Clougher for a catch up and chat with MAPFRE, Team Brunel and Team Alvimedica. 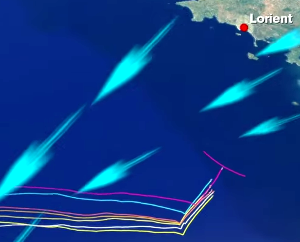 Volvo Ocean Race 2014-15 - Jun 9, 2015 - Stunning aerial footage of the fleet slamming upwind off Cape Finisterre. Next stop: the Bay of Biscay. Inside Track: Leg 8 #4 | Volvo Ocean Race 2014-15 - Jun 9, 2015 - The breeze is building as the fleet rounds the North West corner of Spain. Race legend Mike Sanderson chats with Genny and we call current leg leader SCA. The Volvo Ocean Race fleet is headed north along the Portugal coast--in a few hours, once the fleet "turns" the northwest corner of Spain (see map further below)--expect a windy upwind beat and sprint to the Leg 8 finish at Lorient, France. Inside Track: Leg 8 #3 | Volvo Ocean Race 2014-15 - Jun 8, 2015: A live connection with Skipper Charles Caudrelier onboard Dongfeng Race Team and a quick catch up with ADOR Navigator Simon Fischer - race veteran Katie Pettibone joins Genny for this evenings show. Inside Track: Leg 8 #2 | Volvo Ocean Race 2014-15 - Jun 8, 2015: Genny Tulloch talks to Sam Davies on current leader Team SCA and Team Alvimedica's Charlie Enright about their strategy for this short leg, and Volvo Ocean Race CEO Knut Frostad analyses the overnight tactics as the fleet splits into two distinct groups. VOR, Leg 8 - Jun 8, 2015: Capricious wind conditions push the lucky boats ahead and leave the others stranded in frustration. 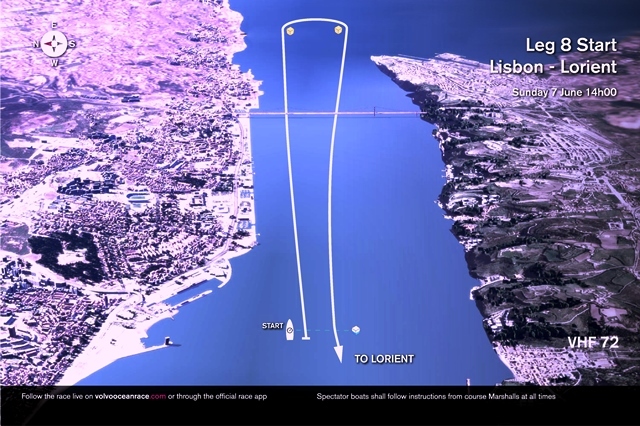 Lisbon Leg 8 Start Highlights | Volvo Ocean Race 2014-15 - Jun 7, 2015: Leg 8 kicked off on a humid Lisbon afternoon, with really tricky and light wind conditions! Here's a look back at the action from the departure, as the fleet set out from Lisbon to Lorient. Voyage into the unknown | Volvo Ocean Race 2014-2015: “...There are light winds chasing up the Portuguese coast, but by the time we get to Cape Finisterre, it should be a dead beat to Lorient, and probably quite windy, over 30 knots,” he says. He is banking on plenty of upwind sailing. “It’ll be interesting as we haven’t had a lot of upwind in this race. We don’t really know what the pecking order is in these conditions, so it could be a very different leg to the others.” The race is intriguingly poised with Abu Dhabi Ocean Racing, on paper, able to clinch overall victory if results go their way when the boats arrive after three to four days of sailing..."
The first European leg takes you through the Bay of Biscay, which is always a sailing milestone. In the last edition, the boats went through one of their worst storms just before arriving in France so do not underestimate these 647 nautical miles. In 2015 the fleet will go straight and not around the Azores as we did in 2011-12. A very fast leg then? Not for the first miles, as they will have to beat upwind. The Spanish coast can steer things a bit with some thermal effects on the northwesterly winds. Then the Bay of Biscay is always interesting. It can be very windy if a good storm is coming from the North Atlantic; it can be very light if a low pressure just went across the Bay. Google says it would take 324 hours to walk from Lisbon to Lorient--how long will it take the Volvo Ocean Race fleet to get there? Could you do this job? | Volvo Ocean Race 2014-15 - Five reasons why you might not want this job, the GoPro camera shows us why! Nationals Edition continues this week in our season finale, reporting on-site at the conclusion of Coed Fleet Race Nationals. The hosts recap the crazy week in Newport and discuss just how significant Yale's sweep of the the championships really is in the historical context of college sailing. "The Beat" - Episode 2: Going to Figawi! - Host Katy Nastro was all in at the 44th Annual Figawi Race Weekend. Figawi kicked off the Cape Cod and Nantucket summer season. Entries include over 3,000 sailors from all over the country and over 240 boats. Katy shares with viewers the Figawi experience from the race course, to the regatta parties, and everything else that comes with this awesome celebration! United States Sailing Association | US Sailing Announces Toronto 2015 Pan American Sailing Team: US Sailing has released the 2015 US Pan American Sailing Team roster. Fourteen American sailors will compete in nine classes* at the world’s third-largest international multi-sport Games this summer in Canada from July 10-26, 2015. Exceeded in size by only the Olympic Games and Asian Games, the Pan American (or “Pan Am”) Games represents a chance for over 7,000 athletes from 41 eligible member nations to compete in 36 sports, including sailing. Overall, the United States Olympic Committee will send approximately 630 athletes to compete across a range of sports in Toronto. “A formidable team of sailors will represent the United States at the Pan American Games in Toronto this July, including members of the US Sailing Team Sperry and three Pan Am Games medalists,” said Josh Adams, Managing Director of US Olympic Sailing. “We are preparing for top international competition in Toronto across the Olympic and non-Olympic classes. Several USA athletes will be racing for the podium. For the young sailors on this team, the experience of competing alongside veteran teammates like Paige Railey and Augie Diaz will provide a unique opportunity in their sailing. Members of the U.S. Pan American Sailing Team will be supported by US Sailing with coaching from the US Sailing Team Sperry (Olympic program) staff, weather analysis, physio support, as well as a logistics operation before and during competition...” Since sailing was included in the Pan American Games in 1955, the United States has won 78 medals in sailing: 33 gold, 27 silver and 18 bronze. *Note on the absence of a US J/24 team at Toronto 2015: The United States did not qualify for the Pan Am Games in the J/24 class. Penalty point pain | Volvo Ocean Race 2014-2015: Team SCA, Dongfeng Race Team and MAPFRE all admitted sailing the wrong way in Traffic Separation Schemes (TSS) and were each penalised a point to be added to their overall total in this low-scoring event. 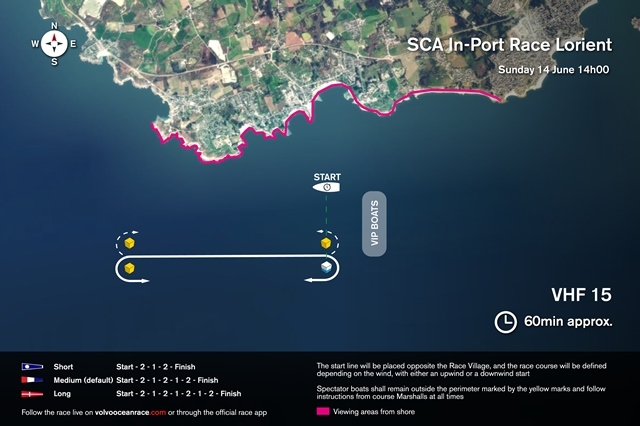 Additionally, Team SCA were given an additional penalty point for sailing into an exclusion zone (see Noticeboard for full details of all infringements). The decisions mean that Dongfeng Race Team drop a further point behind overall race leaders, Abu Dhabi Ocean Racing, Charles Caudrelier’s crew trailing now by six points with two legs to go. Life at the Extreme - Ep. 33 - 'Regeneration' | Volvo Ocean Race 2014-15 - Team SCA receive a warm magenta flag waving welcome in Newport, USA. The Boatyard crew can now spring into action to maintain boats and sails, and American race fans young and old get a chance to visit the boats and meet the sailors. Since we’re in the US, we visit Farr Yacht Design, the naval architects who drew the lines of the one-design Volvo Ocean 65s.